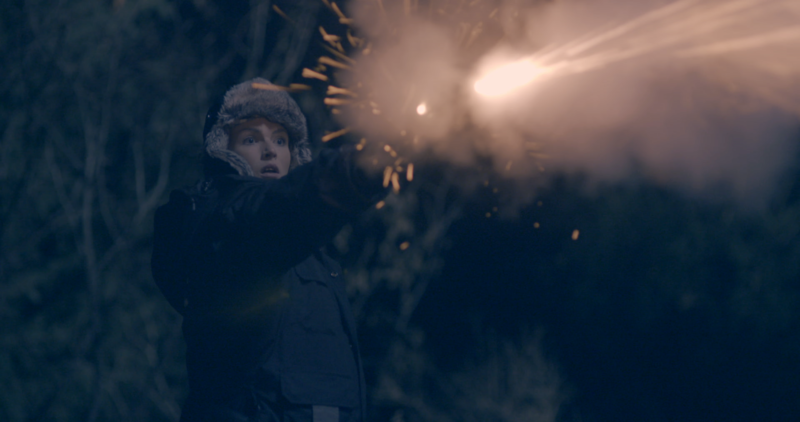 Deadsight is 2018 horror film about a partially blind man and a young pregnant police woman who must work together to escape from a deadly virus that has spread across Grey County. Deadsight has its world premiere at Blood in the Snow Festival. Zombie movies are plentiful these days. Every once in a while, we see one that adds their own twist to the standard, either with their characters or their plot. Director Jesse Thomas Cook‘s Deadsight takes the route of having two rather weaker protagonists, who end up meeting and fighting for survival together. The results make for a refreshing idea not only for having less competent characters but characters both with physical weaknesses or hindrances to their health, forced to fight together. Add to this the compelling reason behind why all this happened and how this deadly virus has caused this zombie apocalypse and you’ve got a unique little film. Ben (Adam Seybold) is partially blind, meaning that the audience can see his attackers before he can, creating a lot of fast-paced tense-filled moments. On the other hand, Mara (Liv Collins), who is pregnant, has the obvious disadvantage of having less physical capacity, yet because she is a police officer she’s trained to be strong and resourceful. As much as these two have their weaknesses, the film never dwells on them too much, making it better for it. Cutting out a lot of any drama is making these two strictly stick to staying alive, so while we never learn too much about their backgrounds, it is their actions which reveal their true nature. We want them to make it. Aside from well-crafted characters, Deadsight also is well-paced. This tendency to remain in the survival elements is something that a lot of horror films forget about. There might not be a whole lot of dialogue between these people but there is a decent lot of zombie attacks, escapes and encounters to make it more than a fair share intense. A part of this has to do with the camera work but an impressive soundtrack that is both subtle yet effective does a lot to draw out the atmosphere. Not to mention the zombies. The zombies do it right.